Montessori & minimalist living are both capable of giving you that instant gratification we all know and love. If you declutter your home I bet you feel like a million bucks when you’re done! The same goes for Montessori, if you start teaching your toddler a new practical life skill and now they can fold their own clothes, I bet you feel like a million bucks! I have been on a long minimalist journey starting way before I even knew what Montessori was. Since having my daughter I have adopted the Montessori way with one main reason, it has a minimalist approach. 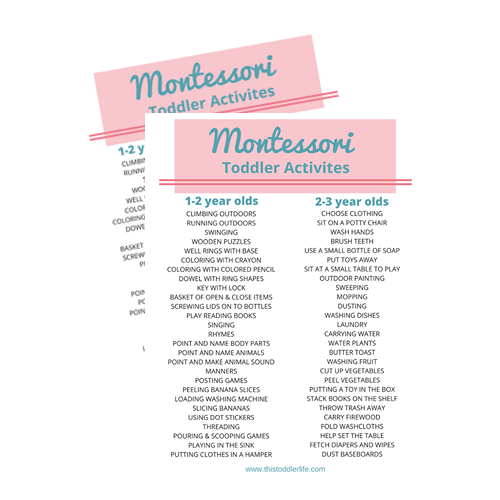 If you’re ready to start practicing Montessori & minimalist living grab this Montessori Quick Start Action Plan today! When you look at Montessori at home or in the classroom, everything has a place and it is not overly cluttered. Montessori & minimalist living go hand in hand. If you’re ready to start embracing either of these journeys, I’m here to help! There is nothing worse than a room cluttered up with a bunch of toys that no one is even interested in. Give your child and yourself a head start and ditch all the loud and flashy toys. The fewer distractions, the better. Teaching your child practical life skills such as sweeping, mopping, washing dishes, folding laundry or brushing their teeth usually doesn’t require any extra materials (less clutter!). AND they’re free! Ask any Montessori expert what your toddler should be working on and this will be their #1 suggestion. A lot of times parents get caught up in having all the Montessori materials available but the most important part of Montessori are the mindsets. Changing your way of life to include these mindsets in everyday life doesn’t cost you anything and they don’t take up any space either. Minimalist living allows for more time outdoors and in your natural surroundings. Montessori encourages exploring the different realities that we each live in. Giving your child the chance to get out in nature and explore their world is the best thing you can do for them at any age! If you keep a capsule wardrobe or if you just don’t have a lot of clothing options this is obviously called minimalist living. But what you might not know is that Montessori also encourages minimal clothing options for your toddler. This gives them a chance to choose their own clothing each day without being overwhelmed with choice. If you’re creating a home full of “yes environments” then you aren’t going to have a lot of space for clutter to build up. You aren’t going to have excess decor or breakables laying around for your child to get into. This is a huge way to bring Montessori & minimalist living into your family home. Instead of buying new toys every few months you can just rotate the toys or materials you do have. Keeping your possessions to a minimum and your child’s interest in their materials at a maximum. If you’re ready to dive right in you may also be interested in HOW TO ORGANIZE THE MONTESSORI WAY or HOW TO DECLUTTER THE MONTESSORI WAY. 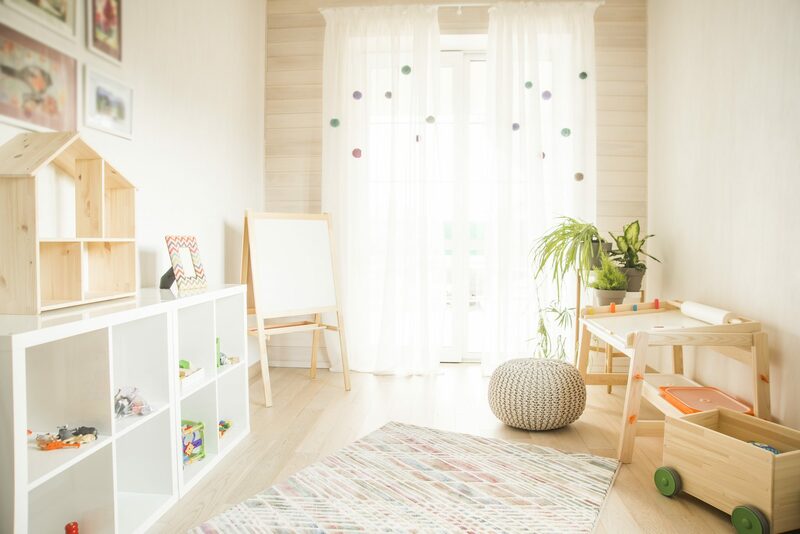 Do you have a Montessori and minimalist home? What ways do you combine the two? Let me know in the comments! We have a family of 6 in a very small home and minimalism + Montessori is how survive! But I do need to work on minimal clothing options. We have acreage and a working farm so the kids are prone to ripping or staining their clothes. I don’t want to have to buy them new clothes if they tear or stain one of their few clothing options. Any ideas? It can be hard with little kids. I know how easily they go through clothes! I would suggest only putting clothes out that they need. You don’t want to overwhelm them with too many choices when learning how to dress themselves. Are you able to put hand me downs and excess clothing in storage somewhere? You can find some great deals on the Facebook Buy/Sell/Trade pages if you decide to cull some clothing and end up needing to buy more clothes for cheap. Awesome post ! It’s Really lovely Toys.Thanks for sharing..! !